How do choices drive original thought? 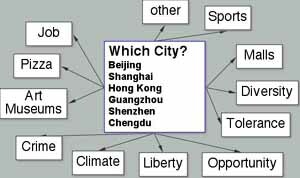 If you could pick one of these cities in China to live and work in for two years, which would be your first choice? More examples of choices below these pictures of Hong Kong . . .
Was Robert Browning a better poet than his wife Elizabeth? Which of these breakfast cereals would be the least healthy? Which ship captain would you pick to join on an expedition? © Jamie McKenzie, 2007, all rights reserved. No copies can be made or distributed in any format without the express written permission of the author.